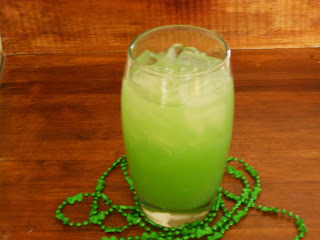 Here is a wonderful celebratory drink to get the party going…and you can make it in the alcoholic or non-alcoholic version…either way it’s delightfully green and festive. So haul out the shamrocks and let the party begin! As I have said in previous posts,being Irish, I love to celebrate St. Patrick’s Day. St. Patrick’s Day isn’t just for getting as bombed as a person can get. It is a family event to celebrate the life of the Patron Saint of Ireland. I thought this recipe had a really interesting taste. It reminded me of the green Hawaiian Punch that had ginger added. My husband said he could see it easily adapt to a shot of Bushmill’s Irish Whiskey if desired. So, here we go!